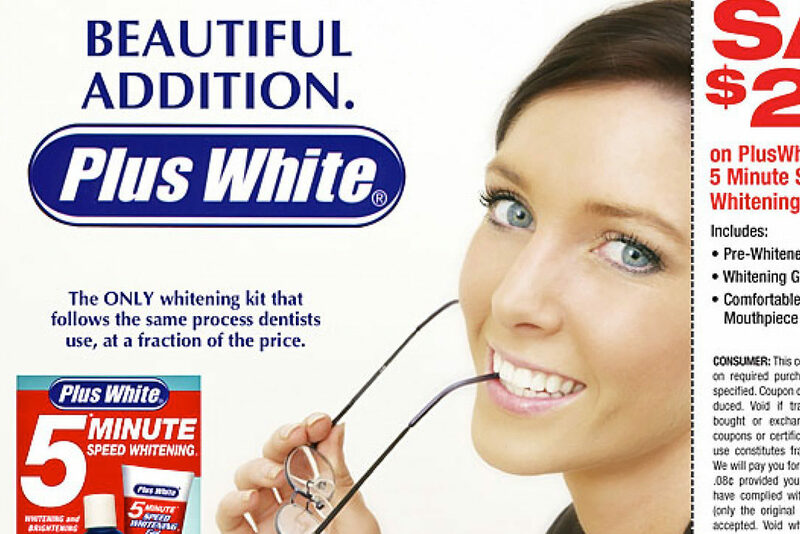 Deliver a Free Standing Insert (FSI) that emphasizes the beauty benefit of the Plus White teeth-whitening kit, a departure from the current “fights stains” strategy. During the input, the client mentioned that (1) this kit is the closest whitening system to what dentists use and (2) it is sold at a better price point than less complete, less effective systems. Neither fact was used in previous marketing materials, yet we recognized that both should be part of the messaging. For the main communication, we used the product name as a unique, ownable element of the beauty-based, benefit-driven headlines. We also used white space as part of the overall “white” messaging. This “plus/addition/logo” idea is highly campaignable across all media—a real value-added contribution to a one-off FSI assignment.